Add RARA polyclonal antibody - Classic to my shopping cart. Request a quote for a bulk order for RARA polyclonal antibody - Classic. Please fill out the form here below. Your local sales account manager will get in touch with you shortly and send you a quotation based on your requirements. Polyclonal antibody raised in rabbit against human RARA (Retinoic Acid Receptor alpha) using two KLH-conjugated synthetic peptides containing sequences from the C-terminal region of the protein. ChIP was performed as described above and the IP’d DNA was analysed with an Illumina Genome Analyzer. Library preparation, cluster generation and sequencing were performed according to the manufacturer’s instructions. The 32 bp tags were aligned to the human reference genome (hg18) using the ELAND algorithm. Figure 2 shows the results of the complete chromosome 19 and two 50 kb region surrounding the HMHA1 and PRAM1 genes, respectively. 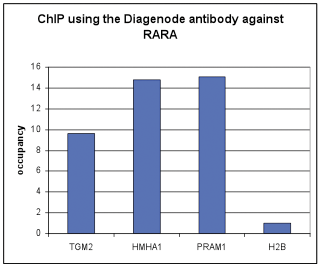 ChIP assays were performed using NB4 cells, the Diagenode antibody against RARA (Cat. No. CS-155-100) and optimized primer pairs for qPCR. Sheared chromatin from 6 million cells and 4 μl of antibody were used per ChIP experiment. QPCR was performed using primers specific for the TGM2, HMHA1, PRAM1 and H2B genes. Figure 1 shows the relative occupancy, calculated as the ratio + control/background for which the second exon of the MB gene was used. 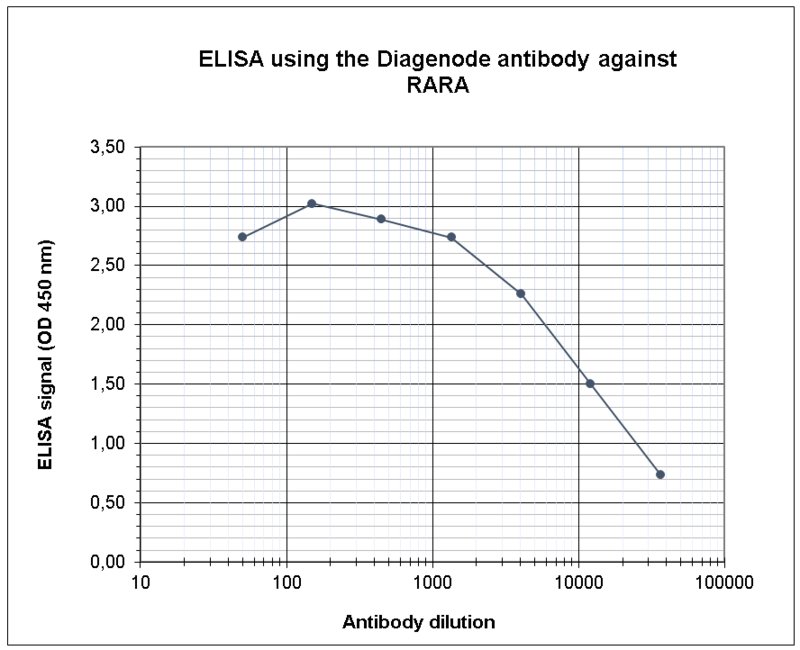 To determine the titer of the antibody, an ELISA was performed using a serial dilution of the Diagenode antibody directed against human RARA (Cat. No. CS-155-100). The plates were coated with the peptides used for immunization of the rabbit. By plotting the absorbance against the antibody dilution (Figure 3), the titer of the antibody was estimated to be 1:2,400. Human embryonic kidney cells (293T) were transfected with a RARA construct (lane 2) or with a negative control construct (lane 1) and analysed by Western blot using the Diagenode antibody against RARA (Cat. No. CS-155-100), diluted 1:750 in BSA/PBS- Tween. The molecular weight marker (in kDa) is shown on the left; the location of the protein of interest is indicated on the right. Diagenode strongly recommends using this:	RARA polyclonal antibody - Classic (Diagenode Cat# C15310155 Lot# A704-001). Click here to copy to clipboard. Retinoic Acid Receptor Alpha Represses a Th9 Transcriptional and Epigenomic Program to Reduce Allergic Pathology. Retinoic acid is essential for Th1 cell lineage stability and prevents transition to a Th17 cell program.